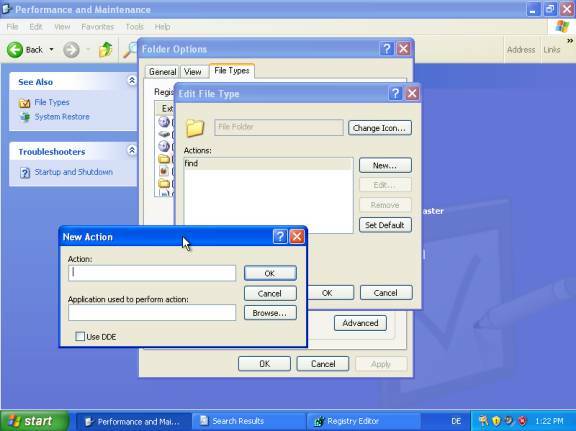 If you have ever tried to set another default application for opening file folders on Windows XP and to turn it back afterwards, you will have run into a really nasty bug. If you try to restore the default settings of an application to open a folder, the folder will no longer open as before (normal explorer window, further folders open in the same window) but will open a search window on doubleclick. You cannot achieve the former behaviour by trying to reset it in the control panel. What you have to do is to create a new opening action for File Folder and set it as default. Afterwards, open Run... and enter regedit to open the Windows Registry. On the left side of the registry, there is a list of directories. Browse this list to HKEY_CLASSES_ROOT > Directory > shell and click on the plus-button next to shell to unfold the actions to open file folders with. Now look for the new opening action you have previously created and set as default. Rightclick it, choose Delete and confirm your choice. It is not enough to delete this entry in the Control Panel, it has to be done in the registry. Close the registry after deletion and try out doubleclicking a folder. It should now open like it usually used to. But mine “Original Default” command is deleted. May I know the code?